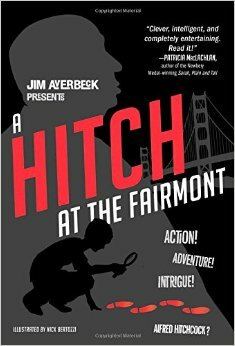 Although Jim Averbeck has written numerous children’s books, A HITCH AT THE FAIRMONT is his debut MG novel. Did he miss the memo on word counts? This one stands at over 60,000 words – probably not one for reluctant readers who typically don’t touch anything thicker than their index finger. With that said I thoroughly enjoyed this unique tale. Younger readers may not get the film connections, but older Hitchcock fans should eat this one up. CONNECTION SIDELIGHT: The title is what first pulled me in. As a teen I had lunch with my aunt at the Fairmont Hotel. I felt very special sitting in that iconic hotel. Years earlier I met Hitchcock, well sort of. I was on the tram ride at Universal Studios. The tram stopped and you could hear a pin drop. From under a tent appeared a man, standing only six feet from me. Mom could have said John Smith because it meant nothing to me. I waved anyway and with his eyes pointed right at me, he returned a short salute before retreating. It was the next year I saw my first Alfred Hitchcock movie, FAMILY PLOT, his final film and the one he had been filming that day we made eye contact. I’ve seen quite a few other Hitchcock films since then, but perhaps my favorite is REAR WINDOW. With that short detour, let me return to Jim Averbeck’s story set in 1956. It’s a unique mystery featuring an 11-year-old boy and his unlikely new companion, Alfred Hitchcock. This one begins as young Jack sits at his mother’s funeral which is what happened in another MG title making its debut this year (SORRY YOU’RE LOST). I hope this isn’t a trend. FULL PLOT (From Amazon): After the mysterious death of his mother, eleven-year-old Jack Fair is whisked away to San Francisco’s swanky Fairmont Hotel by his wicked Aunt Edith. There, he seems doomed to a life of fetching chocolates for his aunt and her pet chinchilla. Until one night, when Aunt Edith disappears, and the only clue is a ransom note written…in chocolate? Suddenly, Jack finds himself all alone on a quest to discover who kidnapped Aunt Edith and what happened to his mother. Alone, that is, until he meets an unlikely accomplice—Alfred Hitchcock himself! The two embark on a madcap journey full of hidden doorways, secret societies, cryptic clues, sinister villains, and cinematic flair. Much of the action is centered at the Fairmont Hotel, but when Hitch and Jack journey to some of San Francisco’s iconic sights, the excitement and fun increases. Cable car rides, Nob Hill, Union Square, Chinatown, Cliff House, and of course the Golden Gate bridge. Each site made me want to revisit this grand city. There is a great section in the back with the background on the story and it helped connect the dots for me. Also included is information on every Hitchcock film referred to in the book as each of the 35 chapters is the name of a Hitchcock movie. Perfect place to start if you have no connection to this popular director’s works. I guessed the big plot reveal early on but getting there was loads of fun. The thrilling conclusion was well worth the wait. Although this a fictional account of Hitchcock, the author did his research to combine the director’s TV personality with that of his regular one. It was heartwarming that a famous director would take young Jack under his care and together they go over clues to solve the disappearance of Jack’s aunt. Jack’s voice is believable and it doesn’t take much into the book before you like spending time with this young protagonist. Jack traced the blocky letters of the Latin phrase with his finger. “Ipse Dis,” he said. My father may have been worthy man, but he certainly wasn’t lucky. ARE YOU KIDDING? No, I’m not and next week is a celebration of my first year in MMGM. It’s my debut contest and the payoff is huge for three lucky readers. See you then if not before! This entry was posted in Reviews and tagged A Hitch at the Fairmount, Jim Averbeck, Middle grade, Middle Grade Book Reviews. Bookmark the permalink. Thanks for the review. I don’t usually read the longer books, but this one sounds interesting and exciting.Congratulations on your first year on MMGM! Time flies and I’ve enjoyed writing the reviews. Hope you’ll sneak by again next week. This sounds lovely, and since I’ve always felt a bit guilty about my knowing absolutely nothing about Hitchcock, I think this would be the perfect way to get to ‘know’ him! Thanks for the heads up, and happy MMGM! I find Hitchcock fascinating, plus I love mysteries, so this sounds like a great read. Thanks for sharing! Wow, 60K words! A bit long for MG, yes. But it sounds intriguing. I love Hitchcock, although The Birds terrified me when I was a kid. 60,000 words? Pshaw! I’ve got one that started life at 120,000 and is now whittled down to 82,000. I have work to do! I want to read this book. I hope I can find time soon. I love Hitchcock. Rear Window is also a favorite of mine. Thanks for this review. Can’t wait to see what you have cooked up for next week. I have the same problem.My first story turned out to be 80,000 plus. Got her down to 45,000 then decided I liked the characters and not the story. Time to rebuild which I eventually did. You will certainly want to stop by next week. Looks to be a fun contest. This book sounds wonderful! I have to read this. I loved that you actually got to see Hitchcock. I spent a lot of my teen years watching Hitchcock with my parents–fond memories. Rear Window is also one of my favorites. Thanks for the informative review–and I’m looking forward to your contest next week! Congrats on approaching your first MGMM year! Whoa on that word count…but the book does sound kind of awesome!